During his lifetime, Pierre Jaquet-Droz (1721–1790) devised shockingly lifelike automata that perplexed observers, entranced monarchs, and even led to allegations of witchcraft. His complex automaton was The Writer, a seated figure capable of writing a pre-programmed sentence up to 40 characters long – a feat that requires a mechanism comprised of some 6000 parts. 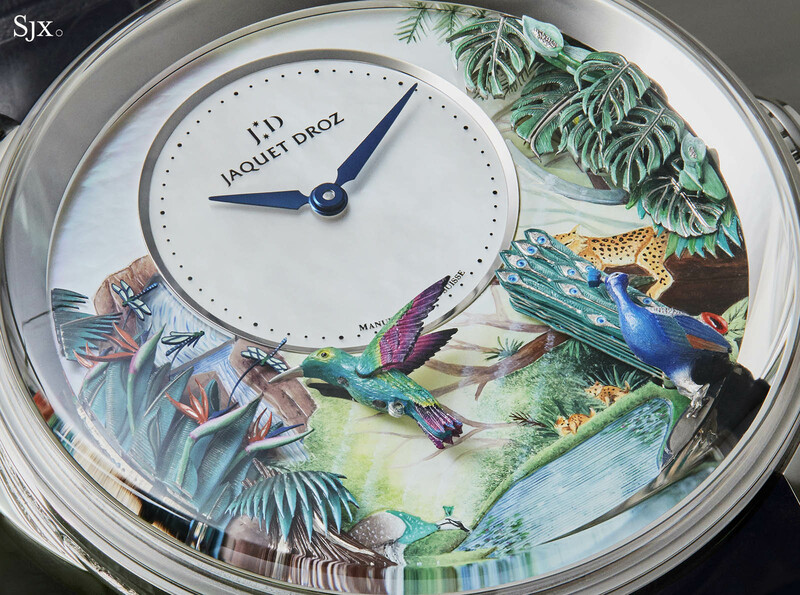 Jaquet-Droz also created a number of singing birds, elaborating on the traditional music box to build hyper-realistic mechanisms that could move and chirp like real birds thanks to ingenious use of bellows and whistles. 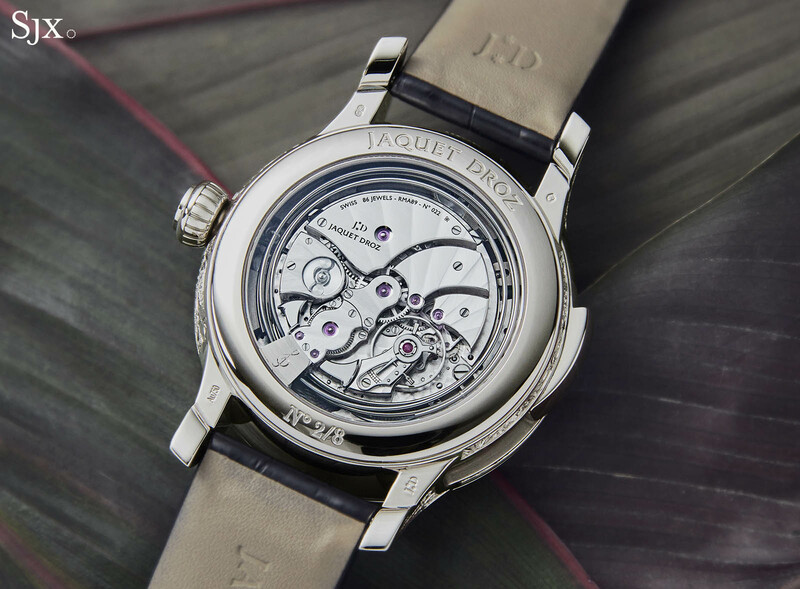 The modern day Jaquet Droz company takes that heritage seriously, having unveiled a series of wristwatches combining miniature automata with a minute repeater. 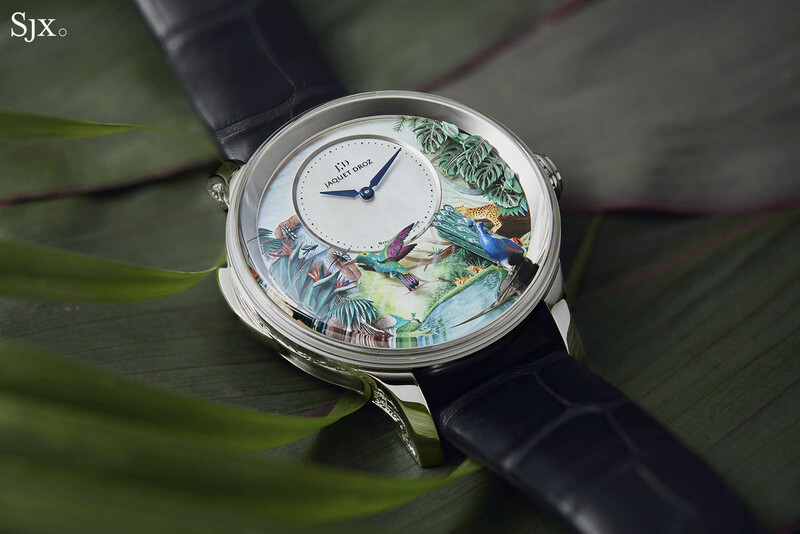 Following the Bird Repeater in 2012 and The Charming Bird (which was actually a tiny singing bird inside the watch case) in 2015, Jaquet Droz unveiled the third instalment at Baselworld 2018 – the Tropical Bird Repeater. A virtuoso combination of artistic crafts and mechanical ingenuity, the Tropical Bird Repeater is available in both 18k red or white gold, each limited to eight pieces. 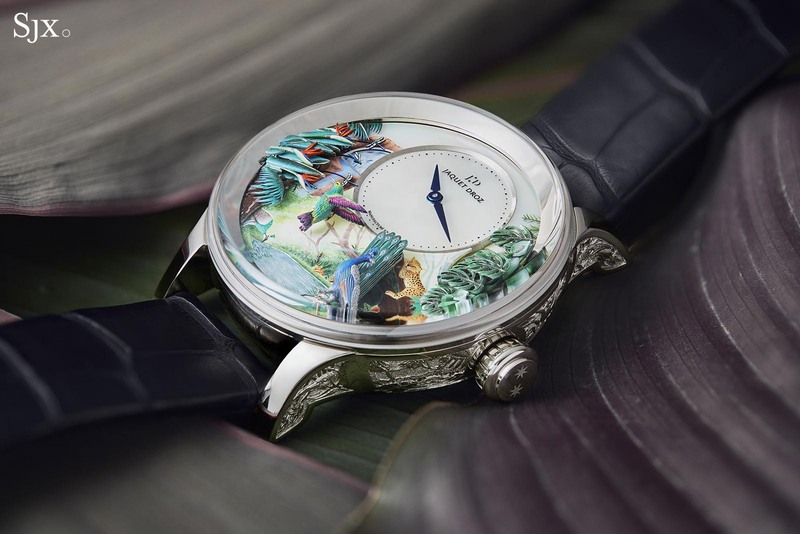 Mechanically the Tropical Bird is similar to the earlier Bird Repeater, but because its tropical jungle scene is brighter and more varied in colour, the watch has more visual presence. And it undoubtedly has physical presence, being a large watch. 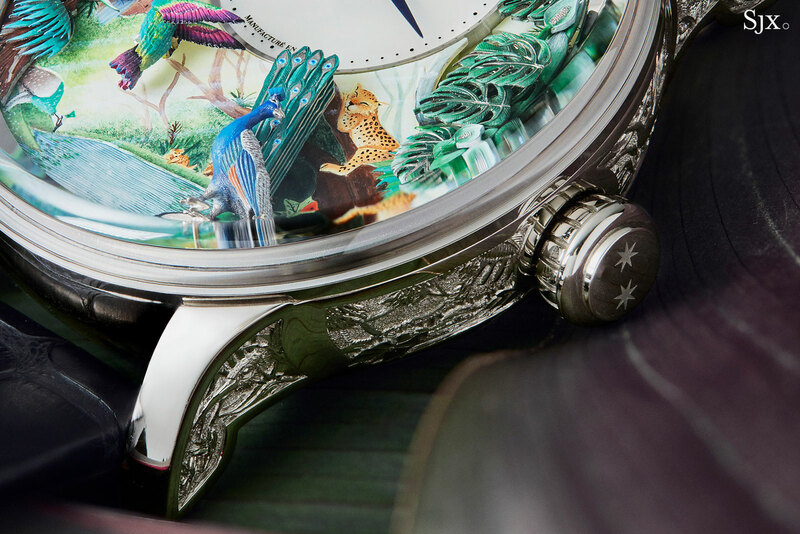 Measuring a massive 47mm in diameter and 18.95mm in height – primarily to accommodate the automaton mechanism – the case is elaborately hand-engraved with a jungle motif on the lugs and case band, a decor that requires over a month to complete. But the elaborate case is merely a prelude to the even more fanciful dial. 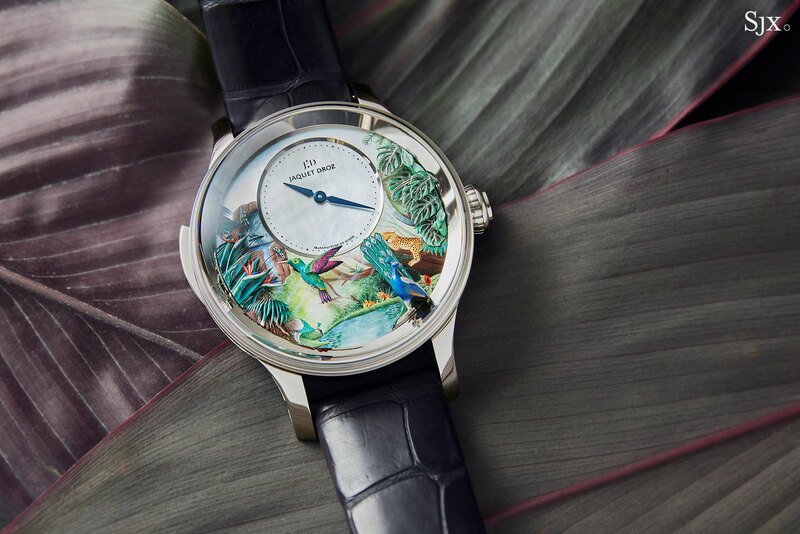 As with most Jaquet Droz timepieces, the flora and fauna on the dial of the Tropical Bird Repeater recalls the Age of Enlightenment – a philosophical nod to the lifetime of Pierre Jaquet-Droz – when natural history became a crucial field of study. The dial alone consists of 77 components, with the simplest being the mother of pearl sub-dial for the time (on the rose gold model the sub-dial is black onyx). All around it is a tropical paradise of foliage and wildlife animated by a series of micro-engineering feats. The pastoral scene has been entirely engraved and painted by hand with a tiny brush and microscope. The sheer density of colour alone is impressive, let alone the exceptional depth of the dial, which has five different layers of relief. Most notable are the animals and plants in high relief, namely the peacock, hummingbird, toucan, dragonflies and foreground plants. And the dial is not only resplendent during the day – at night the dragonflies glow in the dark, having been painted with Super-Luminova. All dial components are in solid gold save for the wings of the hummingbird, which are aluminium to satisfy weight requirements. When the minute repeater is activated, seven animations play out in four different scenarios, each lasting 12 seconds and selected at random. On the top left of the dial, a running waterfall is depicted by a rotating disk, which makes one revolution in approximately 60 seconds. Three minuscule dragonflies, with luminous wings, hover and vibrate over the waterfall. Taking centre stage on the dial is the hummingbird, which inches towards a shrub of orange birds-of-paradise, and also flutters its wings 40 times per second, giving it an extreme realism. To the right, a peacock with intense blue feathers deploys its tail composed of two fans, while a toucan emerges from the palm leaves at three o’clock, moving its beak. Visible through the sapphire case back, the watch is powered by Jaquet Droz RMA89, derived from the Lemania cal. 389/399, which is also used by its sister brand Breguet. It is hand-wound, with a 60-hour power reserve and a frequency of 3Hz, and a high jewel count of 86, thanks for the automata on the front. The automata-less version of the movement has just 31 jewels. 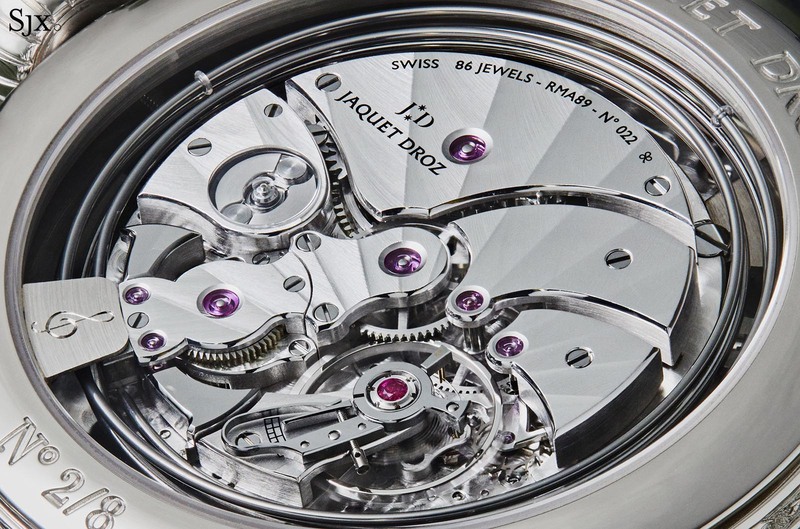 With a construction inspired by vintage movements, explaining its relatively classical bridge layout, the movement has a quiet, monochromatic rhodium finish, but still carefully decorated with radial Côtes de Genève on the bridges and perlage on the base plate, along with finer details like prominent bevels on the bridges and polished countersinks for the jewels. The repeater is fitted with cathedral gongs that are twice the length of ordinary gongs for greater resonance. Activated via a conventional slide on the left of the case, the minute repeater is also equipped with a silent regulator, which lengthens the pause between the quarter hours and minutes, resulting in a more defined, resounding chime. That being said, the sound of the repeater is slightly muffled, an inevitability given the size and weight of the case. 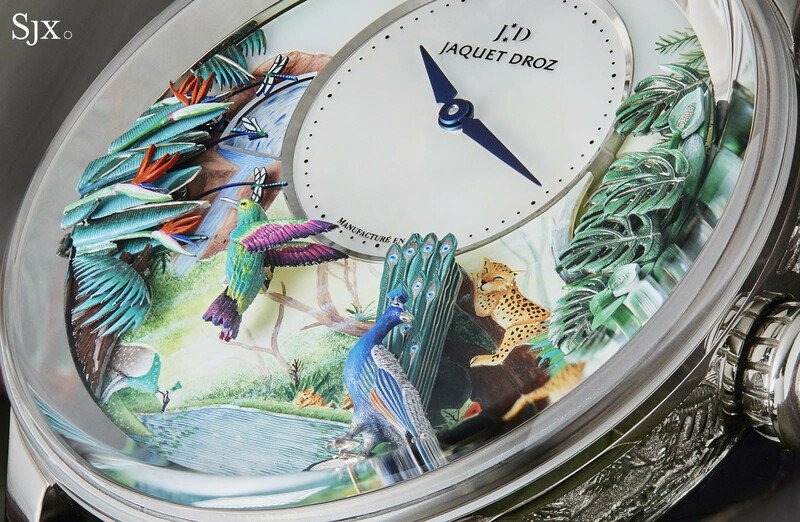 The Jaquet Droz Tropical Bird Repeater is limited to eight pieces each in red or white gold, and priced at US$661,500. 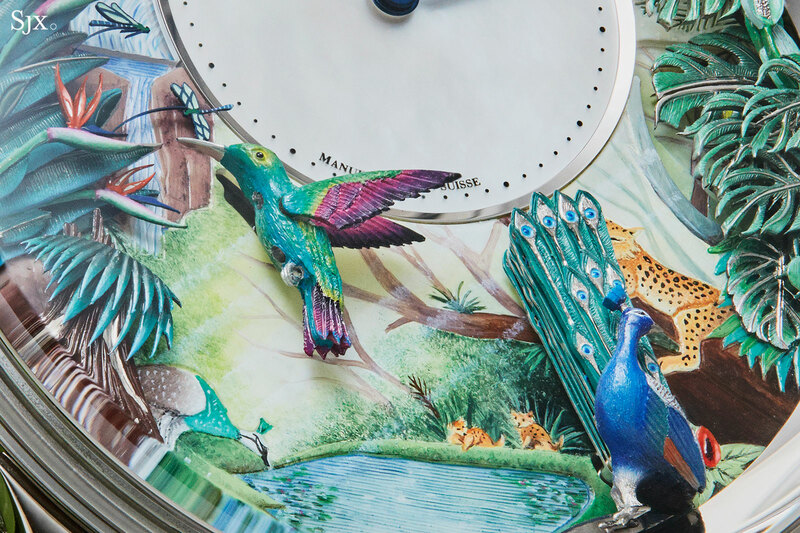 Hands-On with the Jaquet Droz Petite Heure Minute "The Butterfly Journey"
Enamelling and hand-engraving are used to create the finely detailed Chinoiserie dial on the "The Butterfly Journey" limited edition.